WOLVES AND BEARS OR INSECTS AND SNOWSHOE HARES? harvesting only 1 in 10 moose that wolves would have killed, that’s still 1 more moose for our dining tables. End of story. lifestyle as hunters. Just the opposite. It’s a “plot” to save our lifestyle. diligently consider any alternative to exterminating predators because killing is their single solution to all problems. spread of pathogens among our own moose? decades (see Rick Sinnot’s 17 November Dispatch article for details). Worse, a lot of the remaining food is being eaten by other herbivores. and root rot. (Read the article by Dr. John Morton, supervisory biologist for the Kenai National Wildlife Refuge, at www.facebook. 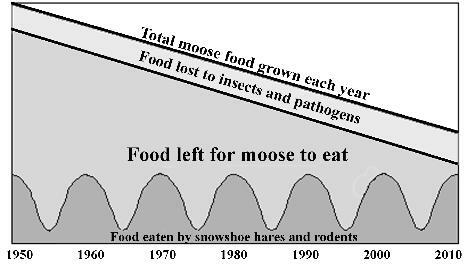 of that total; snowshoe hares cycling with a peak roughly every decade, and moose having to survive on the fraction of food that’s left over. Is this how carrying capacity for moose has declined in recent decades? t shown. But the basic pattern should be realistic enough to illustrate how the current bottleneck in carrying capacity happened. see is enhancing predation on hares by owls and other raptors, as well as by mammalian carnivores such as lynx, fox, coyote, and wolf. 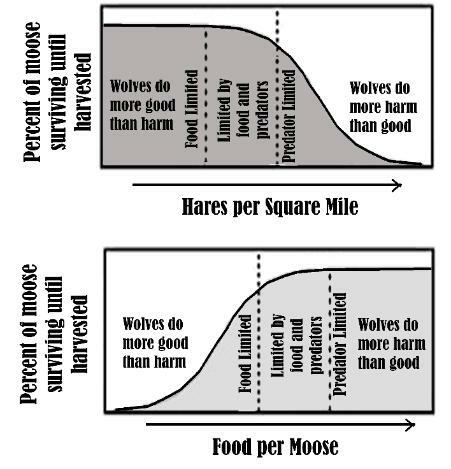 How much does the diet of wolves shift from moose to hares as hare abundance increases? 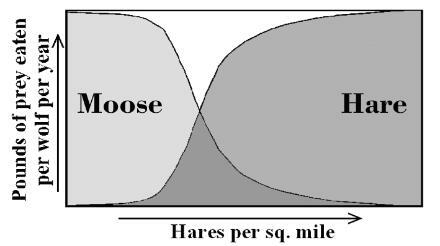 moose meat vs. hare meat at any density of moose and of hares. Hopefully, ADF&G biologists are finally free to provide the answers. – as now appears to be true on the Kenai Peninsula. optimizing wolf abundance rather than on minimizing it? provide us with the full benefit of their intelligence. drastically reducing wolf and bear numbers won’t do more harm than good. articles and several books, including the Alaska Magnum Bear Safety Manual and When Bear’s Whisper, Do You Listen? Wolves and Bears -- or Insects and Snowshoe Hares?